Growing up in Missouri, I dreaded summertime. Summers in St. Louis were steamy and hot. Just a few minutes of exertion and sweat would drop off my forehead. Trying to play tennis in the mugginess brought on a whole new level of fatigue. But the one thing that I always looked forward to was summer vacation. To be more specific, road trips to Colorado got all of us excited. Somewhere past Hays, Kansas, the humidity turned to a dry heat. Driving across the plains of western Kansas and eastern Colorado brought anticipation — when would get our first glimpse of the Rocky Mountains? My brother and I would compete with each other squinting in the distance. If the day brought clear blue skies, one of us would usually glimpse the jagged form of Pikes Peak around Limon. During those childhood trips, we would go farther west on I-70, stopping at places like Vail and then going up to Aspen. We stayed at the Limelight Lodge and ate at the local steakhouse for dinner. I remember stopping in a gift shop and buying a skier mobile to hang in my bedroom back home. Strange, because back then I’d never been skiing in my life. It must have been foreshadowing the adventures of my adult life. Back then, Aspen felt like just another mountain town. Our middle-class mid western family could afford to stay at the local motel and eat out at night. Aspen seemed cute and quaint, but not particularly well to do. Prior to our family vacations, I knew it mainly through one of my favorite musicians — John Denver. He lived in Aspen, and he seemed to be just a country boy. It couldn’t be that swanky. 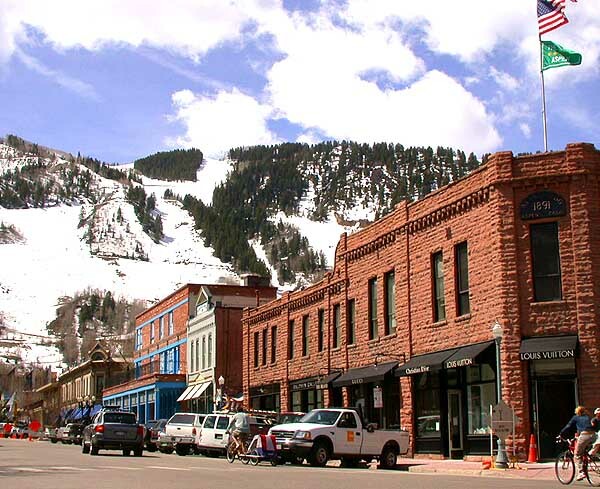 Like many mountain towns in Colorado, Aspen started out as a mining town. It boomed to a population of over 15,000 during the 1880s due to silver mining. However, when the price of silver plummeted in 1993, the population collapsed to less than a 1000. Many of the historic buildings in Aspen like the Wheeler Opera House date back to the silver boom. Aspen got a new lease on life through skiing when the Aspen ski resorts were founded in the 1930s. These days Aspen is home to the uber-rich and celebrity. The four Aspen ski resorts attract visitors from all over the world. We are not among them. The last time we visited Aspen, we camped at the nearby Maroon Bells campground. Hotels during the summer season are way out of our price range. One night, we decided to eat in town, rather than eat freeze-dried camp food. It was a stretch to find a place that we could keep the bill under $100 for the two of us. While walking around town after dinner, we stopped in a clothing stores where a pair of blue jeans cost $300. This wasn’t the quaint ski town I remembered from my childhood. This weekend we are going to experience another side of Aspen, its famous ski resorts. I got a scholarship through PSIA to attend a 2-day all mountain ski clinic for instructors at the vaunted Aspen Mountain. A part of me is nervous. Aspen is famous for steep terrain with bumps and trees. But it’s also exciting to ski a new place and experience the Aspen of wintertime (ok, maybe springtime). I”ll get a whole new perspective on all that Aspen has to offer. If you build it, will the water come?